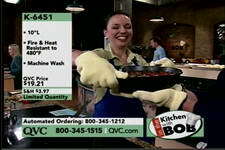 A friend of mine, Laura, was on QVC today as a “product expert” for some high tech oven gloves. She needed props to demonstrate how much heat the gloves can handle, so she came over to look through my stuff. She needed stuff that looked like it would burn a hole through your hand. My trusty Lodge 12” cast iron skillet, Calphalon round griddle, and Craftsman infrared thermometer all made it on the show. The idea was to heat these up to glowing red, show it with the thermometer, then pick up the pans and handle them as if they were cool. She put some food in the skillet and got it boiling, picked it up and set it in the host’s hands. She also pulled out some bread from a cast iron loaf pan, and handled it as if it was cool as well. They were going to do more demonstrations, but the gloves sold out in 3 minutes, so they cut her off. Oh well, I guess that’s the point, but I wish they would have shown my stuff a bit more!